Art needs you, and your opinion. No education or experience required. Even if you only see one thing at ArtPrize—if you liked it, vote for it. Artwork is created for you to respond to, and at ArtPrize, your response counts. Did the artwork move you? Did it grab your attention? Did it make you feel anything? Did it spark a new conversation or foster new understanding? Would you hang it in your home? Do you just... like it? You decide what wins your vote. No explanation necessary. Voting has never been easier at ArtPrize. Simply open up the ArtPrize mobile app while you’re here, sign in, and cast a vote. Once you’ve voted at ArtPrize, you can vote from anywhere in the world. Download the App: Find the ArtPrize mobile app, free for iOS and Android devices, in the Apple Store and Google Play. Sign In: Complete the mobile app’s simple sign in process, including a quick authentication process via text message. Visit ArtPrize: While you’re in the ArtPrize district, make sure your phone’s location services are turned on. That’s how we know you’ve visited the event and are eligible to vote this year. Cast Your Votes: Found artwork you love? Tap the “thumbs up” icon to vote with the entries’ five-digit vote codes. Or tap the “guidebook” icon to search for entries through a complete list of entries, venues and artists—tap the “thumbs up” vote button on each entry you’d like to vote for. Cast a vote, get a tote. Thanks to Meijer, once you cast a vote at ArtPrize, you can go to any ArtPrize HUB to pick up the exclusive ArtPrize Nine tote. They’re functional and beautiful. Get them while they last. Log Into Your Account: When you’re back on your computer, come back here to artprize.org and click “Sign In” near the top right corner of the site, then log into your account. Find Your Favorite Entries: Click “Find Art” in the top left navigation bar. There you can search for your favorite entries through a complete list of entries, venues and artists. If you can’t find what you’re looking for, try typing in a few keywords or filtering the entries by clicking “Show Filters” near the top right of the page. Cast Your Votes: Found artwork you love? Cast your votes by clicking the “thumbs up” vote button at the top of each entry’s profile. Cast a vote, get a tote. Thanks to Meijer, once you cast a vote at ArtPrize, you can go to the Visitor Pavilon, located at Rosa Parks Circle to pick up the exclusive ArtPrize 10 tote. They’re functional and beautiful. Get them while they last. ArtPrize is an open international art competition decided by public vote and expert jury. Every year, ArtPrize distributes a half a million dollars in cash prizes, making the event the world’s largest art competition. 2-D – Entries that exists primarily on a flat plane. Painting, drawing, photography, printmaking, and most textiles are examples of 2-D work. 3-D – Entries that occupy space and are intended to be viewed from multiple angles. Sculptures that are not site-specific belong in the 3-D category. Installation – Entries that are dependent on the site in which they are installed. Installations are usually 3-D works, but are different from 3-D in that the location is part of the work, and moving the piece to another setting would dramatically change the work. Time-Based – Entries that are durational and change over time. The viewer has to spend some time with the work to fully view it. This includes performance, video and film, dance, music, and interactive work. Grand Prize winners can come from any category. At ArtPrize, there are no spectators. Visitors like you who register to vote take an active role as judge and critic. Using mobile devices and the internet, the general public chooses five Public Vote winners—four $12,500 category awards and one $200,000 Public Vote Grand Prize—in two rounds of voting. In addition to the Public Vote, ArtPrize presents parallel Juried Awards—four $12,500 category awards and one $200,000 Juried Award Grand Prize. The jury also presents an award for Outstanding Venue, given to the curator of a Venue, not a participating Artist. The prizes are awarded through two rounds. The first round narrows the field of artist entries to two sets of finalists—twenty decided by public vote and twenty by expert jury. The second round removes the distinction between the two sets of finalists, bringing them together to form a pool of up to forty finalists. The voting public (that’s you!) and jury of art experts will have the opportunity to consider all forty finalists, regardless of how they were selected, when choosing the winners of their respective awards. It's possible for an entry to win both a Public Vote and Juried Award, including both Grand Prizes -- one entry, "Intersections" by Anila Quayyum Agha, did just that in 2014, taking home $300,000 in prizes. Vote for your favorite entries! During Round 1 of voting, every entry at every Venue in the ArtPrize District is in the running for the big prizes. See as much art as humanly possible and vote for the artworks you think deserve a spot in the Public Vote Final 20. You could cast one vote for every entry, but try to vote only for artwork that you personally find compelling. There are no rules about which artwork deserves your votes—it’s entirely up to you. When Round 1 closes, the top five entries from each of the four categories—revealed at the Public Vote Final 20 Announcement—move on to Round 2. While you’re voting for your favorite entries, the Category Jurors assess the entries within their respective categories, each selecting a shortlist of five entries—announced at the Jurors’ Shortlist event. These forty finalists move on to Round 2 to compete for the two $200,000 Grand Prizes and $100,000 in category awards. Take another look at the 40 Finalists and vote for the ones you think deserve to win the $12,500 public vote category awards and, ultimately, the $200,000 Public Vote Grand Prize. Just like in Round 1, you could cast one vote for each of the 40 Finalists, but try to vote for the ones you think most deserve to win in each category. Again, there are no rules for which artwork deserves your vote. At the end of Round 2 voting, the Artist entry with the most Round 2 votes in each category will win their $12,500 category award. 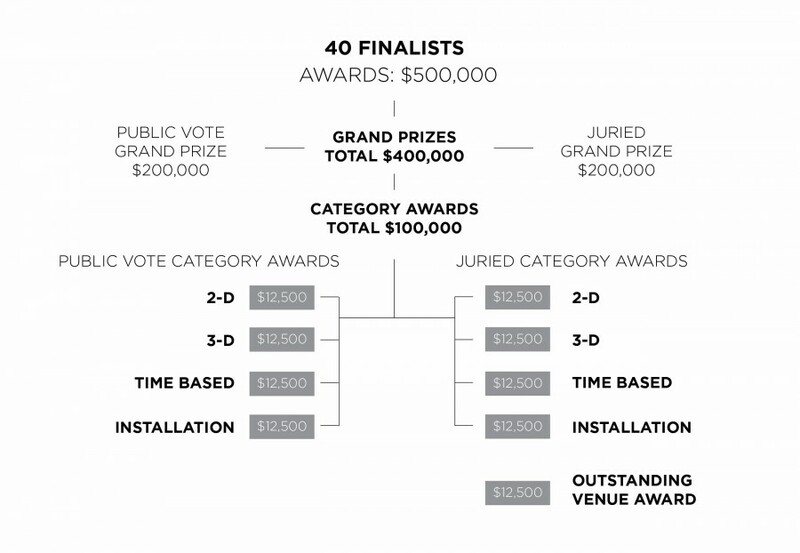 The Artist with the most Round 2 votes overall will be awarded the $200,000 Public Vote Grand Prize. ArtPrize announces the winners of $500,000 in public vote and juried awards at the annual ArtPrize Awards ceremony. Find out which artist entries will take home part of the $500,000 in cash prizes—awarded equally by public vote and expert jury. The two-time Emmy Award-nominated ArtPrize Awards Ceremony will be broadcast live on NBC affiliate WOOD TV8. You must be at least 13 years old to sign up for an artprize.org account and register to vote at ArtPrize. You must have an individual email address to sign up for an ArtPrize account. If you don’t have an email address, you can create a Gmail account for free; if you need help, go to the ArtPrize Visitor Pavilion, located at Rosa Parks Circle and the ArtPrize staff and volunteers will help you create an email account. You must physically attend the event in order to vote. Verify that you’ve attended the event by downloading the ArtPrize mobile app and having your location services turned on while inside the ArtPrize district; or stop by the ArtPrize Visitor Pavilion, located at Rosa Parks Circle to register with a volunteer! Read the Official Rules for Voters for more detailed information. Our Visitor Pavilion is the best place to start your visit to ArtPrize. There you’ll find free resources including our event guide*, maps, hands-on art making activities, and voter registration support. Monday-Saturday: 10 a.m. – 8 p.m.
*Thanks to MLive Media Group, the 2018 ArtPrize Event Guide is FREE. One event guide per visitor. Have questions? We're happy to help. Send us an email at support@artprize.org anytime.